The Watch House is towards the southern end of Bermondsey Street, at its junction with Abbey Street, standing on the corner of St Mary Magdalen churchyard, a lovely, green space. The small, single-storey octagonal building can best be described as lozenge-shaped, with long front and back walls and three short walls at either end, making it maybe three times as wide as it is deep. Brick-built, it still retains its original chimney and inside, it’s open to the rafters of the A-frame roof. The only entrance, a pair of narrow, glass double doors, is in the middle of the front wall, with a single large window high up in each of the end walls at the front. There are also a few smaller windows dotted around, which provided a surprising amount of light on the sunny afternoon when I was there. There’s an L-shaped counter which occupies the whole of the left-hand end, starting immediately to the left of the door and running along the whole back wall, ending at the chimney breast which is at the right-hand end of the back wall. The only seating is on the right, where a built-in wooden bench seating runs around the three end walls from the door to the chimney. There are two-person tables at each end and, in the middle, effectively three tables in one, following the angles of the wall. Additional seating is provided by boxes at each table, all of which double as storage space, the seat lids hinging open to reveal various goodies inside. Indeed, The Watch House is adept at making the most of what little space it has, the counter-front being pressed into action, housing rows of retail shelves. Talking of space, laptops are allowed during the week, but not at weekends and, while there’s no convention power outlets, there are pairs of USB charging points, two for each of the five seats around the right-hand end. When it comes to coffee, The Watch House uses local roasters, Ozone, with the Empire Blend on espresso, serving a fairly standard menu. The Watch House, like many London cafes, has done away with pour-over, serving batch-brew filter instead. However, what’s unusual is that three single-origins are offered rather than the more usual one, with the options changing every week or so. While I was there, the choices were a Brazilian (pulped natural), a Burundi (washed) and an Ethiopian (natural). The barista let me try all three, giving me little samples in an espresso cup. 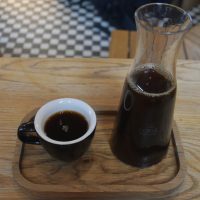 Of these, the Ethiopian Ardi was by far my favourite, leaping out at me, so I ordered that, which was served in narrow carafe, cup on the side (I reused the espresso cup I’d used for tasting), all presented on a small wooden tray. I can’t say enough about the Ardi. It’s a wonderful coffee, really bursting with flavour. Rich and fruity, it was everything that I expect a good naturally-processed coffee to be and it was still gorgeous when it was cold. It also serves as a reminder against my ingrained prejudice that batch-brew can’t be as good as hand-pour, which is just not the case. This was as good as anything I could have made for myself. I paired this with a Hazelnut Brownie, an equally-wonderful cake, gorgeous, rich, and gooey. Perfect. December 2018: The Watch House, Bermondsey Street was a runner-up for the 2018 Best Filter Coffee Award. This entry was posted in Breakfast, Cafes, Cake, Laptop Friendly, Lunch, South East London and tagged include, Ozone by Brian Williams. Bookmark the permalink.